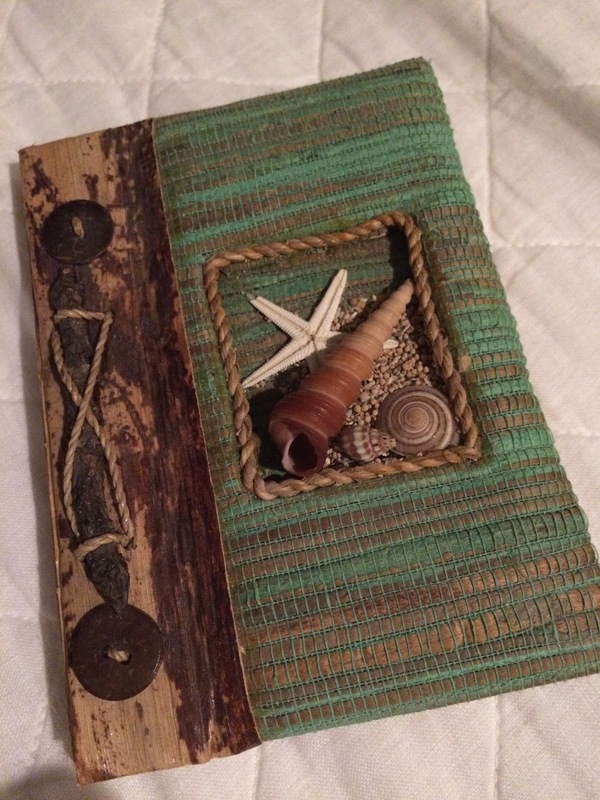 A few years ago a woman I hardly knew gave me a small handmade journal, bound with string and buttons, and covered with fabric and seashells. Her name was Mary. We met at a gathering of mutual friends. Playing cards and sharing a bottle of red wine, we laughed, and told stories about our lives. She asked about my work, and seemed mildly amused by my being a school principal. I suppose I don’t look or behave like a principal when I’m playing cards on a warm summer evening. She was a cashier at a liquor store, three blocks from my house, small world. We drank and talked some more. I told her about my desire to write, using my standard line . . . I’ve got something to say, I just don’t know what it is. Wide eyed, she smiled, told me to wait one second and ran outside to her car. She returned with a small journal in hand, this is for you. Maybe it was the wine, or perhaps a menopausal moment, my eyes welled up with tears. She laughed nervously, and told me she made these journals and wanted me to have one. The journal was not one I would choose for myself, not my style at all. But I loved it because the giving was sincere, unsolicited and straight from the heart. I told Mary it was beautiful and I meant it. The following morning when I pulled the journal from my purse, I decided its content should be specific. I would fill it with notes and observations about the beautiful gifts I saw in everyday life. I kept the journal on my nightstand and, at first, was diligent about jotting down my ideas and thoughts before I went to sleep . . . A man with his toddler son sitting on his shoulders, holds his ankles tightly and kisses his tiny calf . . .Tara’s beautiful pregnant belly. . .The sound of families talking and laughing, especially mine. . . Patrick reaching for my hand. . . Hanging with Moe, Jeri and our girls, Tara, Carley and Riley. . . Silent laughter with my sisters. . .The smell of the ocean and the sound of the waves. This reflection at the day’s end kept my psyche in check, and chronicled the good in my life and my world. My notes soon turned into short narratives . . . My grandson Luca is born and my life is changed forever. Luca Anthony Tombrello, an old soul who already knows all of us. I love the way he smells, the way he feels and his tiny, tiny lips touching mine. He is tiny but so powerful. He has changed all of us forever. . . Dog Beach with Gus and Patrick, a slow walk, Patrick laughs at Gus and I smile at the sound. . . My mom’s best friend Brenda holds my grandson for the first time. As I drove her home she looks up and says out loud to heaven, “I held your great-grandson Judy!” And she smiles and laughs. . . Patrick looks at me propped up on a pillow, he leans down and kisses my forehead, looks at me again, and kisses my forehead one more time. . . Those entries, those words pure and true warm me from the inside out. Each one scribed in my journal and on my heart. One afternoon I was tidying up my bedroom and found the journal buried beneath my collection of self-help books and 12 step stories. As I leafed through it, I saw the last entry was more than a year old. What? How could that be? Had I not been paying attention to the daily gifts in my life? I know they existed, my life was not void of beauty and happiness. I sat on my bed feeling a little disappointed, realizing that my focus had shifted from what was right in my life to what needed fixing, True, there were aspects of my life that definitely needed improvement, but not at the expense of ignoring all that was good. I needed to restore balance. I immediately tried to think of something positive to write, a little nugget of beauty from the day. In that moment I was stumped. I couldn’t think of anything. I left the journal on top of the pile of reading material, and vowed to pay attention to the good stuff. I began again, looking for the gifts in each new day. And because I was looking, it was amazing how easy they were to find. . . . I received an honest and loving letter from Patrick. It is truthful, painful and beautiful all at the same time. We will always love each other. . . I’ve had a few days off and spent some time with Luca. He plays and plays and I just watch him. He shows his happiness by stopping his play, looking at me and saying “kiss.” He offers me his sweet little lips and I kiss him. . . Loving Matt’s company. . . I stop by to see Luca. We watch monster truck videos. I tell him how much I love him, he says, “love you all day” . . . I found a letter written by my mom on the occasion of my 40th birthday. I am reminded of all my good qualities. Miss you mom xoxoxo . . . Matt asks me, “Did I tell you yet today that I love you? I say “you told me this weekend, but not today, ” He says, “I love you.” . . . Matt is talking to me and he says, “Why are you laughing at me?” I say, “I’m not laughing, I’m smiling at you.” He says, “I know and it’s adorable.” I smile more. . . A child is walking outside my office with his mother, he says “That is Mother Nature Mama.” I look out my window and he is looking proudly at his mama and pointing to a rose. The gifts were never missing, I just wasn’t paying attention. I saw Mary only a handful of times after that summer evening, she moved away, up north somewhere. She may never know the impact of her gift, how it inspired me to look for beauty and joy in my ordinary life. Most of us are purposeful and aware of how our actions impact the lives of our families, closest friends, and those we influence with our work. I think more often, through chance meetings and random shared experiences, and without knowing, we impact the lives of strangers or people we barely know. Unaware, we make a difference in some one’s life. This can be as simple and sweet as making a bad day a good day, or as brave as bringing hope where there is despair, or as exciting as igniting passion or inspiration where there is complacency. Suddenly, these stray moments seem very powerful. I am grateful for my chance meeting with Mary and the influence of her simple gesture. A few days ago, I found the journal on my nightstand . . . not so buried and only two months since my last entry. I was happy about that. It felt like growth, progress. I reread every entry, many more than are shared here with you. Each one a tiny gift and no matter how often I read them I am filled with happiness and gratitude, fortunate to not only have had these experiences, but to recognize their beauty. There aren’t many pages left in the journal and when every page is full, the practice of writing about life’s gifts will continue. For me, my writing is prayer. I discovered these words written by St. Therese and was astounded by how they captured my feelings, she says “For me, prayer is an aspiration of the heart, it is a simple glance directed to heaven, it is a cry of gratitude and love in the midst of trial as well as joy; finally it is something great, supernatural, which expands my soul. . . ” And for me, unites me with the Universe. At the end of this day . . . reflect . . . find the gifts . . . and pray. Your kind words inspire me to keep on going. I hope you continue to enjoy the writing. Thank you Christine, another story that touched my heart. I must admit it was hard to continue reading through my tears after your comment in regard to Brenda and her holding your mom’s great-grandson. I can’t wait for the next story. Wow! Another entry to whisk me off into gentle, grateful dreams! Christine Rose is Like Water…she wants to share her “Gift” to everyone, enjoy! Great and inspiring post. An attitude of gratitude shifts reality in loves favor. Awesome post and a good reminder (for me, at least) that the wonderful properties of quantum physics do exist in our daily life – the phenomena is not contained to the subatomic level. Thanks for this. I am retired now and able to savor every minute of every day…….a true gift.